Rikers Island Violence Persists Despite Scrutiny, Report Says This latest report has fueled the debate on closing the jail facilities on the island. New York Mayor Bill de Blasio walks past a group of protesters after voting in the Democratic primary on Sept. 12, 2017 in Brooklyn. The protesters are calling for the closing of the Rikers Island jail complex. The New York jail complex Rikers Island maintains a "culture of violence" among both inmates and staff, despite efforts to improve conditions at the storied correctional facility, according to a recent government report. The court-mandated report said staff on the island "relish confrontation" with inmates, rather than avoid it. It described incidents such as a senior corrections officer using pepper spray on an inmate who was in restraints, and other incidents of unnecessarily kicking and stomping inmates. Filed by an independent monitoring group, the report has fueled calls to shut down the jail complex because of its level of violence. Rikers, a 400-acre island in the East River, serves as New York City's main jail complex, a warren of 10 distinct facilities managed by the New York City Department of Correction. The island also houses a bakery, firehouse, over 1,000 parking spaces and a power plant. The jail complex is one of the best-known in the U.S., both for its frequent role in television crime dramas and for coming under national criticism for its conditions. The majority of those held at Rikers' jail facilities are awaiting trial; the rest are serving short sentences for low-level offenses. According to the recently released report, the island detains an average of 9,300 people per day. The panel that authored the report was tasked with analyzing changes by the NYC DOC, to see if correction staff's use of unnecessary force was reduced as a result, and if they have prevented inmate-on-inmate violence. Although overall inmate-on-inmate violence has reduced, the overall rate of use of force by correction officers has slightly increased. Elias Husamudeen, president of the New York City correction officers' union, the Correction Officers' Benevolent Association, Inc. rejects the monitor report, saying the heightened scrutiny and report findings are disingenuous to the reality of what happens at the facilities. With the high level of violence on Rikers Island and dangerous work conditions for correction officers, Husamudeen says they should be "getting a medal from the monitor, as opposed to saying there's excessive use of force." "Most of [the uses of force are] because correction officers have to break up fights between inmates," Husamudeen added. "I think the monitor is disingenuous to say the least. To say the least – disingenuous at what [the monitor group] is saying, that there's an excessive use of force." But for activists like Glenn E. Martin, working to close the jail complex, the report just validates the arguments he has been making in the fight against Rikers. "When I think about the report, for people who have served time on Rikers, none of that is surprising," Martin, founder and president of JustLeadershipUSA said. Martin is a well-known advocate for criminal justice reform, having worked with criminal justice reform organizations since the early 2000's. Last year, he began spearheading the #CloseRikers campaign, pressuring public officials to shut down the jail. When it comes to Rikers, Martin is familiar with the situation: He was incarcerated there twice, the first time as a 16-year-old for shoplifting. "I stayed there for two days and was stabbed four times on the second day," Martin said. "The fourth time in my neck, with a pen that was melted and fashioned into a knife." Six years later, Martin spent a year as an inmate on Rikers Island, and then six years in a New York State prison for robbery. 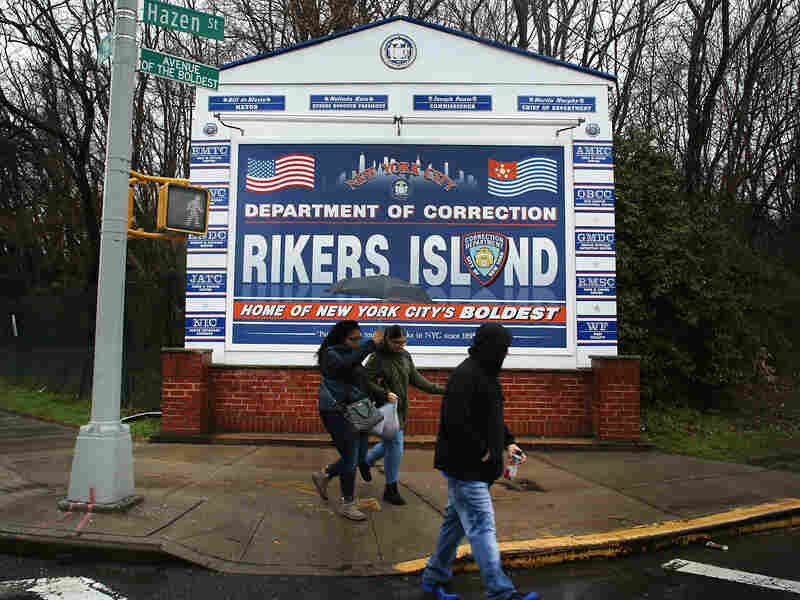 People walk by a sign at the entrance to Rikers Island on March 31, 2017. New York cITY Mayor Bill de Blasio has said that he agrees with the fundamentals of a plan to close the jail complex within 10 years. "What's most interesting about that is, after the first experience on Rikers years earlier, this time on my way back I remembered the culture and I knew I needed to be part of the violent culture — because the only way to avoid violence on Rikers was to be violent on Rikers," Martin said. "So I remember going to Rikers and immediately creating turmoil and getting into fights, and showing other people there that I wasn't going to be a victim this time." Martin is now 46 years old. Even though more than 20 years have passed since his time on Rikers, he said this new report shows little has changed regarding the island's "culture of violence." In 2011, a group of detainees filed a lawsuit against the NYC DOC — called Nunez and United States v. City of New York — for cruel and unusual punishment. In 2013, the suit was filed as a class action. Inmates alleged correctional officers would take detainees to areas without surveillance cameras or witnesses and beat them. In 2015 the Justice Department intervened, and a consent settlement was reached, which included more than 300 provisions the NYC DOC was tasked to implement. The changes included an improvement to internal policies, more conflict resolution training for staff, more security cameras, and enforced disciplinary actions for staff violating use-of-force guidelines. To make sure the various changes from the Nunez decision were being implemented, the Southern District Court of New York organized a monitoring group to audit the Rikers facilities. This newest monitor report — the fourth of its kind — studied uses of force on Rikers from the first half of 2017. The group began analyzing the situation at Rikers in October 2015, and with such short intervals between reports, they recognize major milestones may not be achieved during each monitoring period. This is not the only instance when changes have been implemented on Rikers. Also in 2015, the NYC DOC began the nearly two-year-long process of ending punitive segregation — also known as solitary confinement — for inmates 21 years of age and younger. This step, along with the other provisions outlined in the Nunez case, are frowned upon by the correction officers' union and Husamudeen, who says heightened regulation is limiting for staff. "You take away our tools. You take away the things that have been successful that we've used, that have been successful in keeping violence down in NYC jails," Husamudeen says. "You take away punitive segregation — that some people call solitary confinement — you take that away from us for the 16- to 21-year-olds, the most violent population of inmates. You give us nothing in place for it." The end to the use of punitive segregation on Rikers came after Kalief Browder's case. Browder spent almost three years locked up on Rikers waiting for a trial — mostly in punitive segregation. His robbery charges were eventually dropped, but the psychological effects of his time on Rikers lingered. In 2015, Browder committed suicide at 22-years-old at his mother's house. According to the report, the NYC DOC has made substantial progress with two provisions: policy and training. Even though there have been improvements with these two provisions, staff continue to employ an unnecessary use of force. The report says some staff "relish confrontation rather than avoid it" and that avoiding confrontation is "anathema" to many supervisors and staff. "We take seriously our agency's role in ensuring public safety in the city every single day and providing a safe, humane environment for our staff and those in our custody. We all share the same goal: safe jails," DOC Commissioner Cynthia Brann said in a statement. Brann is in charge of Rikers and the other New York City jails. The 259-page report states year-by-year comparisons suggest use of force "may be increasing a bit." The report makes it clear that force is justified when dealing with some inmates, particularly to reduce violence on other inmates or officers themselves. But the report also lists examples of correction staff using excessive force. One account tells of a captain using a crowd-control canister of pepper spray on an inmate who was already restrained and lying face-down on the ground. From January to June of this year, there were a total of 2,243 instances of use of force, according to the report. From January to June of 2016, there were 2,223 instances of force. Since there has been a decline in the inmate population in the last year, these numbers show there has been a 9 percent per capita increase in the rate of use of force, since the same period last year. 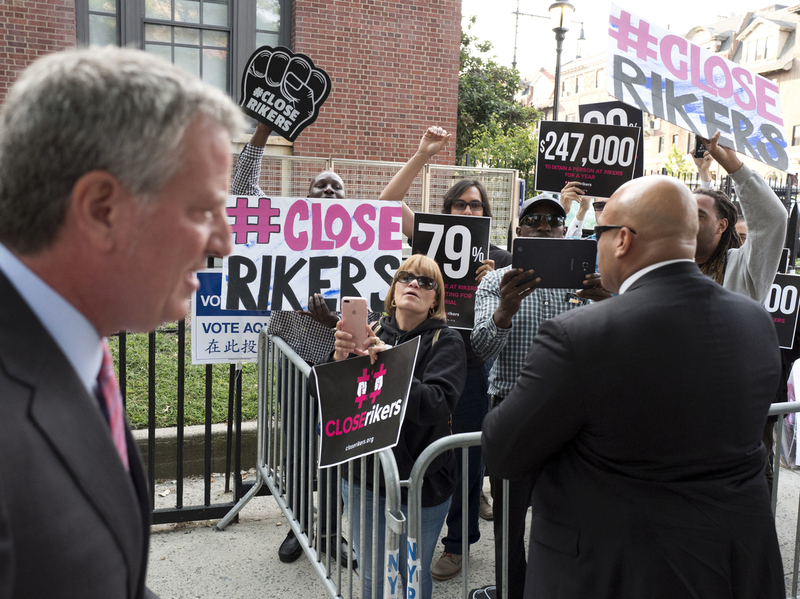 In June of this year, New York City Mayor Bill de Blasio announced a 10-year plan to close Rikers Island and replace it with a network of smaller jails in the NYC boroughs. This came after consistent grassroots organizing and pressure by activists like Martin and the #CloseRikers campaign. But Martin is skeptical about the mayor's decade-long plan. "Obviously, [de Blasio] won't be mayor in 2027," Martin said. "By the mayor coming out and articulating 10 years, to me, 10 years is the equivalent of never." New York Gov. Andrew Cuomo, meanwhile, said he would support a bill to close the facilities on Rikers in three years, not 10. The next monitor report will look at Rikers from July through December of this year and will be released in 2018. In the meantime, Martin and his campaign will continue to pressure the city government. "Our campaign continues to be strong, we're not going to take our foot off the gas," Martin said.